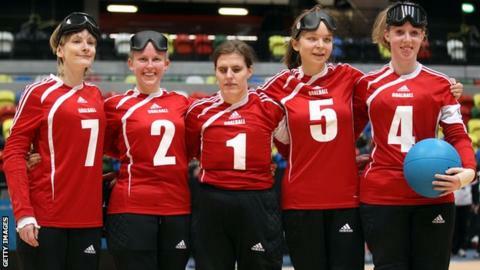 Great Britain will be represented in every paralympic sport at London 2012 after its goalball and women's sitting volleyball teams made the grade. The British Paralympic Association so both men's and women's teams could reach the standard. "I am proud of the process we have gone through with these sports," said BPA chief executive Tim Hollingsworth. "I strongly believe we have the right outcome." Both sports needed to meet the BPA's criteria for "credible performance" which is being demanded of the 300-strong British Paralympics athletes going to the Games. At a recent tournament in Venice, both ParalympicsGB goalball teams finished in the final four and the women were in contention for the gold medal. Hollingsworth added: "In setting such clear parameters for what constitutes credible performance, in particular what progression we expected to see since November last year, we have remained true both to our standards for the team and our ambition to have athletes compete in every sport in London." The next stage for both sports will be the nomination of athletes to fill these slots, which will take place in May and June. BPA performance director Penny Briscoe said: "Neither of these sports was in the British team in Athens or Beijing so this has been a tough journey and they both know that there is still a long way to go, with a lot of hard work to be put in before the Games."